2013 went by pretty fast , don’t you think ? Happy New Year to you all ! 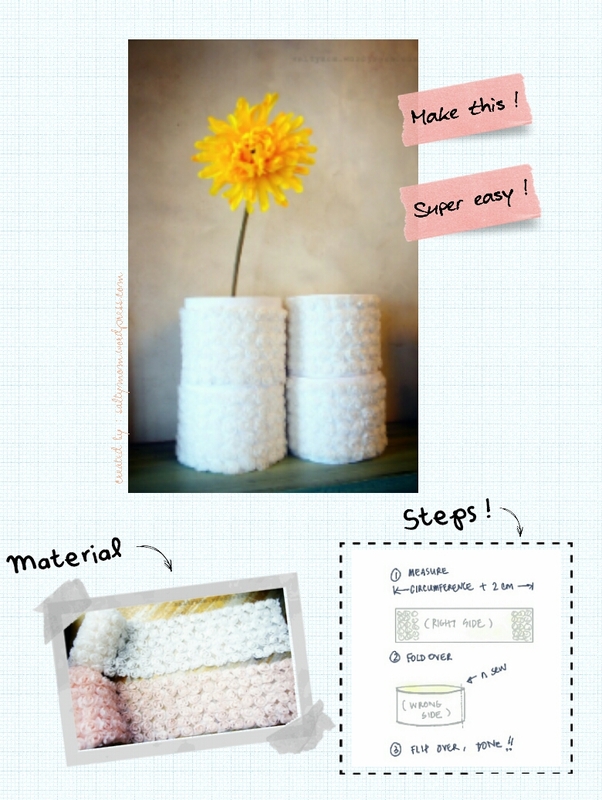 Idea #1 : Use your toilet rolls as decorations then you won’t have to worry about finding places to store them. Imagine filling a whole shelf this way. It would soften up the whole bathroom. 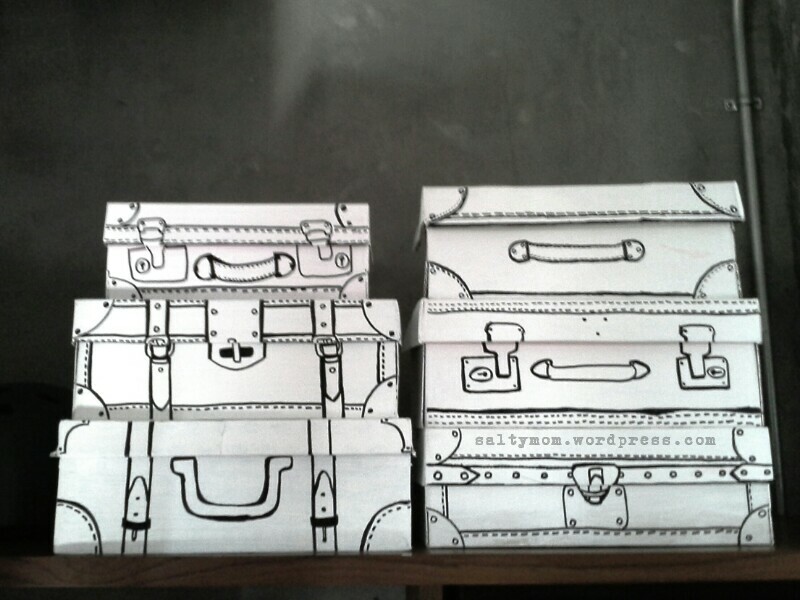 Idea #2 : Paint your shoeboxes and Sharpie them into mini vintage luggage. I found this idea on Pinterest. 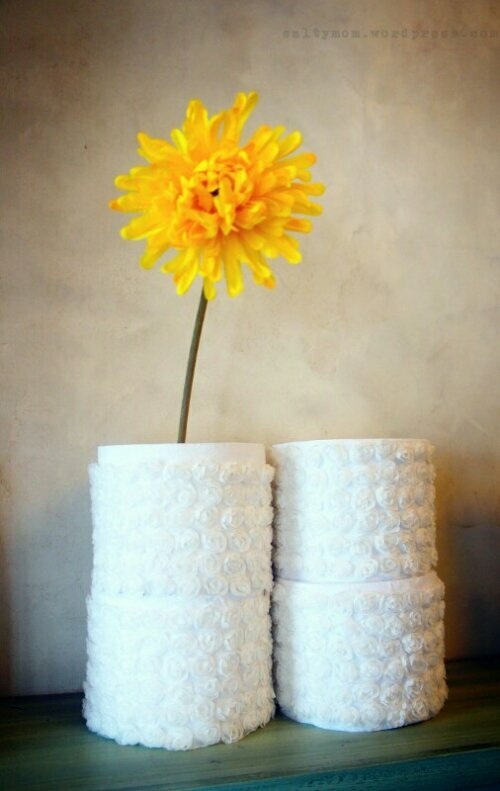 You should take a look at this site ( Brigitte.de ) which is a treasure trove of decorating ideas. The DIY was quite simple and took about an afternoon. I painted all the shoeboxes white, even those with glossy finishings could be painted over with a few coats of acrylic paint. When they’ve all dried , I drew over them with permanent markers using the photo I found as a guide. It now houses DVDs and it looks quite good too ! Idea#3 : Chalk your walls. When we were renovating our house, this wall was our “what should we do with it ? ” wall. At first we were going to do a raw red brick wall, but thinking about usage ( Asian cooking = grease build up all over the place ) it wasn’t a smart thing to do. The contractor got sick of our indecision , so he order it to be painted green. 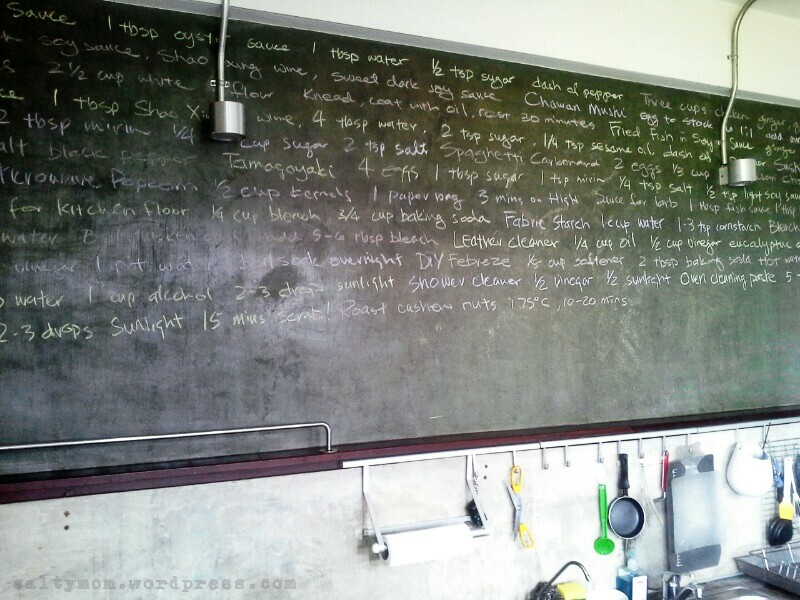 Hence, we got ourselves a wall size chalkboard. 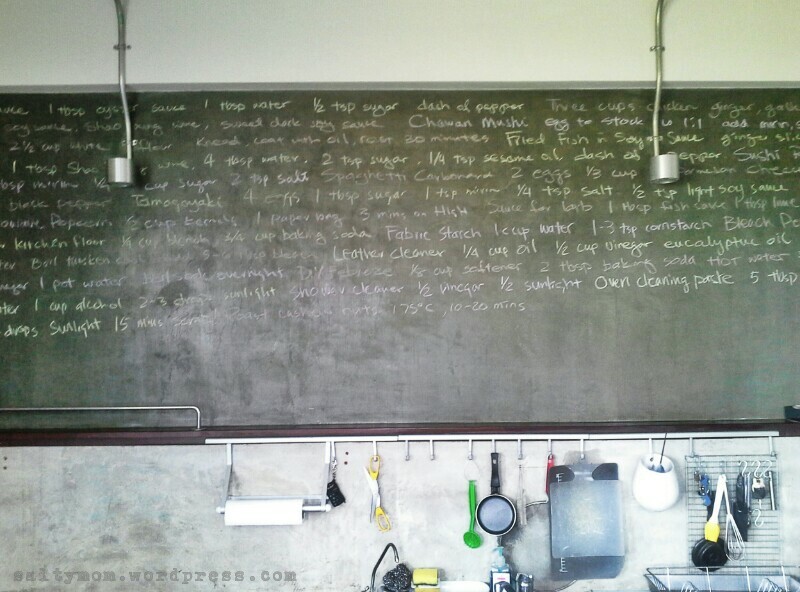 I wrote down ingredients of recipes both food and cleaning. 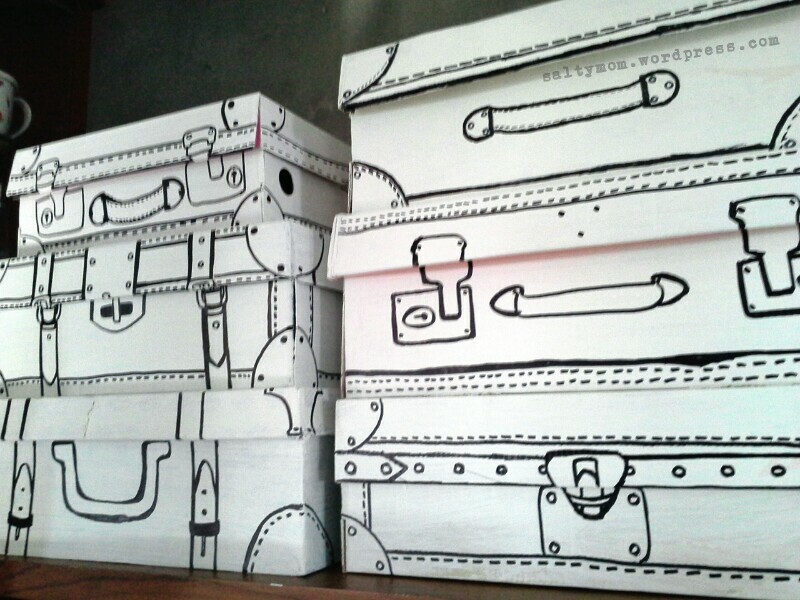 Love the shoe box luggage! love the mock suitcases, it would be fun to decorate them as our kids travel to different places and see the state/world.You wrote that you based the suitcase designs on a photo. where’s the photo? Can you post it?